Early animal life (Ediacaran biota) evolved from protists during the pre-Cambrian period, which is also known as the Ediacaran period. The pre-Cambrian period ( Ediacaran period ) took place between 635-543 million years ago. Early animal life, called Ediacaran biota, evolved from protists; it was previously believed early animal life included only tiny, sessile, soft-bodied sea creatures, but scientific evidence suggests more complex animals lived during this time. Sponge-like fossils believed to represent the oldest animals with hard body parts, named Coronacollina acula, date back as far as 560 million years. The fossils of the earliest animal species ever found were small, one-centimeter long, sponge-like creatures, dating before 650 million years, which predates the Ediacaran period. The discovery of the fossils of the earliest animal species provided evidence that animals may have evolved before the Ediacaran period during the Cryogenian period. The time before the Cambrian period is known as the Ediacaran period (between 635-543 million years ago), the final period of the late Proterozoic Neoproterozoic Era. It is believed that early animal life, termed Ediacaran biota, evolved from protists at this time. Some protist species called choanoflagellates closely resemble the choanocyte cells in the simplest animals, sponges. In addition to their morphological similarity, molecular analyses have revealed similar sequence homologies in their DNA. Earth’s history: (a) Earth’s history is divided into eons, eras, and periods. The Ediacaran period was the final period of the Proterozoic Era which ended in the Cambrian period of the Phanerozoic Era. (b) Stages on the geological time scale are represented as a spiral. The earliest life comprising Ediacaran biota was long believed to include only tiny, sessile, soft-bodied sea creatures. However, recently there has been increasing scientific evidence suggesting that more varied and complex animal species lived during this time, and possibly even before the Ediacaran period. Fossils believed to represent the oldest animals with hard body parts were recently discovered in South Australia. These sponge-like fossils, named Coronacollina acula, date back as far as 560 million years. They are believed to show the existence of hard body parts and spicules that extended 20–40 cm from the main body (estimated about 5 cm long). Other organisms, such as Cyclomedusa and Dickinsonia, also evolved during the Ediacaran period. Fossils from Ediacaran period: Fossils of (a) Cyclomedusa and (b) Dickinsonia that evolved during the Ediacaran period. Another recent fossil discovery may represent the earliest animal species ever found. While the validity of this claim is still under investigation, these primitive fossils appear to be small, one-centimeter long, sponge-like creatures. These fossils from South Australia date back 650 million years, actually placing the putative animal before the great ice age extinction event that marked the transition between the Cryogenian period and the Ediacaran period. Until this discovery, most scientists believed that there was no animal life prior to the Ediacaran period. Many scientists now believe that animals may, in fact, have evolved during the Cryogenian period. During the Cambrian period, the most rapid evolution of new animal species occurred, but the cause of this explosion is still unknown. Echinoderms, mollusks, worms, chordates, and arthropods (including arthropods called trilobites which were the one of the first species to exhibit a sense of vision) developed during the Cambrian period. Environmental changes such as rising levels of atmospheric oxygen and an increase in oceanic calcium concentrations may have caused The Cambrian Explosion. A continental shelf with numerous shallow pools that provided the necessary living space for larger numbers of different types of animals to co-exist may have caused the Cambrian Explosion. The Cambrian Explosion may have been a result of ecological relationships between species, such as changes in the food web, competition for food and space, and predator-prey relationships. The evolution of Hox control genes resulting in animal complexity and flexibility may have provided the necessary opportunities for increases in possible animal morphologies. The Cambrian period, occurring between approximately 542–488 million years ago, marks the most rapid evolution of new animal phyla and animal diversity in earth’s history. It is believed that most of the animal phyla in existence today had their origins during this time, often referred to as the Cambrian explosion. Echinoderms, mollusks, worms, arthropods, and chordates arose during this period. 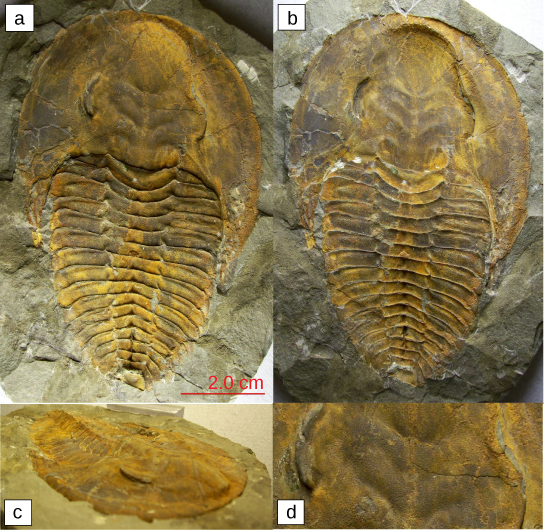 One of the most dominant species during the Cambrian period was the trilobite, an arthropod that was among the first animals to exhibit a sense of vision. Trilobites: These fossils (a–d) belong to trilobites, extinct arthropods that appeared in the early Cambrian period 525 million years ago and disappeared from the fossil record during a mass extinction at the end of the Permian period about 250 million years ago. 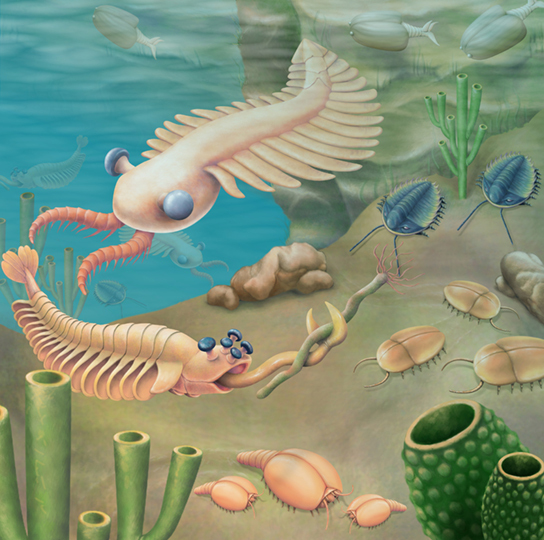 Cambrian period: An artist’s rendition depicts some organisms from the Cambrian period. The causes of the Cambrian explosion are still debated. There are many theories that attempt to answer this question. Environmental changes may have created a more suitable environment for animal life. Examples of these changes include rising atmospheric oxygen levels and large increases in oceanic calcium concentrations that preceded the Cambrian period. Some scientists believe that an expansive, continental shelf with numerous shallow lagoons or pools provided the necessary living space for larger numbers of different types of animals to co-exist. There is also support for theories that argue that ecological relationships between species, such as changes in the food web, competition for food and space, and predator-prey relationships, were primed to promote a sudden, massive coevolution of species. Yet other theories claim genetic and developmental reasons for the Cambrian explosion. The morphological flexibility and complexity of animal development afforded by the evolution of Hox control genes may have provided the necessary opportunities for increases in possible animal morphologies at the time of the Cambrian period. Theories that attempt to explain why the Cambrian explosion happened must be able to provide valid reasons for the massive animal diversification, as well as explain why it happened when it did. There is evidence that both supports and refutes each of the theories described above. The answer may very well be a combination of these and other theories. 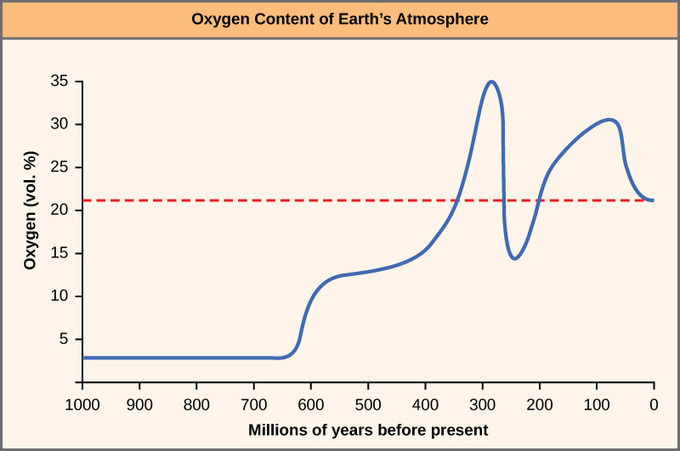 Earth’s oxygen concentration: The oxygen concentration in earth’s atmosphere rose sharply around 300 million years ago. Unresolved questions about the animal diversification that took place during the Cambrian period remain. For example, we do not understand how the evolution of so many species occurred in such a short period of time. Was there really an “explosion” of life at this particular time? Some scientists question the validity of this idea because there is increasing evidence to suggest that more animal life existed prior to the Cambrian period and that other similar species’ so-called explosions (or radiations) occurred later in history as well. Furthermore, the vast diversification of animal species that appears to have begun during the Cambrian period continued well into the following Ordovician period. Despite some of these arguments, most scientists agree that the Cambrian period marked a time of impressively-rapid animal evolution and diversification that is unmatched elsewhere during history. The post-Cambrian era was characterized by animal evolution and diversity where mass extinctions were followed by adaptive radiations. During the Ordovician period, plant life first appeared on land, which allowed aquatic animals to move on to land. Periods of mass extinction caused by cataclysmic events like volcanic eruptions and meteor strikes have erased many genetic lines and created room for new species. The largest mass extinction event in earth’s history, which occurred at the end of the Permian period, resulted in a loss of roughly 95 percent of the existing species at that time. The disappearance of some dominant species of Permian reptiles and the warm and stable climate that followed made it possible for the dinosaurs to emerge and diversify. Another mass extinction event caused by a meteor strike and volcanic ash eruption occurred at the end of the Cretaceous period, bringing the Mesozoic Era to an end and pushing dinosaurs into extinction. The disappearance of dinosaurs led to the dominance of plants, which created new niches for birds, insects, and mammals; animal diversity was also brought on by the creation of continents, islands, and mountains. The periods that followed the Cambrian during the Paleozoic Era were marked by further animal evolution and the emergence of many new orders, families, and species. As animal phyla continued to diversify, new species adapted to new ecological niches. During the Ordovician period, which followed the Cambrian period, plant life first appeared on land. This change allowed formerly-aquatic animal species to invade land, feeding directly on plants or decaying vegetation. Continual changes in temperature and moisture throughout the remainder of the Paleozoic Era due to continental plate movements encouraged the development of new adaptations to terrestrial existence in animals, such as limbs in amphibians and epidermal scales in reptiles. Changes in the environment often create new niches (living spaces) that contribute to rapid speciation and increased diversity. On the other hand, cataclysmic events, such as volcanic eruptions and meteor strikes that obliterate life, can result in devastating losses of diversity. Such periods of mass extinction have occurred repeatedly in the evolutionary record of life, erasing some genetic lines while creating room for others to evolve into the empty niches left behind. 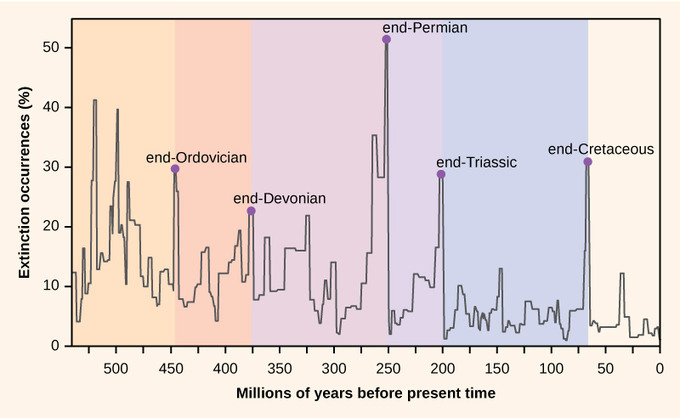 The end of the Permian period (and the Paleozoic Era) was marked by the largest mass extinction event in Earth’s history, a loss of roughly 95 percent of the extant species at that time. Some of the dominant phyla in the world’s oceans, such as the trilobites, disappeared completely. On land, the disappearance of some dominant species of Permian reptiles made it possible for a new line of reptiles to emerge: the dinosaurs. The warm and stable climatic conditions of the ensuing Mesozoic Era promoted an explosive diversification of dinosaurs into every conceivable niche in land, air, and water. Plants, too, radiated into new landscapes and empty niches, creating complex communities of producers and consumers, some of which became extremely large on the abundant food available. Mass extinctions: Mass extinctions have occurred repeatedly over geological time. Another mass extinction event occurred at the end of the Cretaceous period, bringing the Mesozoic Era to an end. Skies darkened and temperatures fell as a large meteor impact expelled tons of volcanic ash, blocking incoming sunlight. Plants died, herbivores and carnivores starved, and the mostly cold-blooded dinosaurs ceded their dominance of the landscape to more warm-blooded mammals. In the following Cenozoic Era, mammals radiated into terrestrial and aquatic niches once occupied by dinosaurs. Birds, the warm-blooded offshoots of one line of the ruling reptiles, became aerial specialists. The appearance and dominance of flowering plants in the Cenozoic Era created new niches for insects, as well as for birds and mammals. Changes in animal species diversity during the late Cretaceous and early Cenozoic were also promoted by a dramatic shift in earth’s geography, as continental plates slid over the crust into their current positions, leaving some animal groups isolated on islands and continents or separated by mountain ranges or inland seas from other competitors. Early in the Cenozoic, new ecosystems appeared, with the evolution of grasses and coral reefs. Late in the Cenozoic, further extinctions followed by speciation occurred during ice ages that covered high latitudes with ice and then retreated, leaving new open spaces for colonization.